The financial impact of efforts to increase adenoma detection rate during colonoscopy. Colonoscopy is the most effective method for prevention of colorectal cancer (CRC). More than 15 million colonoscopies are performed in the United States yearly. It is widely recognized that there is variable quality in colonoscopy as measured by the adenoma detection rate (ADR). High ADR strongly correlates with lower risks of CRC (Table 3),resulting in increasing pressure to optimize ADR. Multiple methods increase ADR including educational interventions, high-definition colonoscopies, and specific techniques such as double examination of the right colon, adequate bowel preparation, surface washing and inspection behind folds and flexures (Table 4). Multiple devices, such as specialized caps have also been shown to increase ADR. Despite proven benefits, many of these measures have not been widely adopted. A significant impediment to improving quality and ADR is the associated cost, which can include retraining, higher-resolution endoscopes, chromoendoscopy and specialized caps, all of which are not reimbursed. The cost, however, may be indirectly offset by financial gains associated with improving ADR. In addition to the established clinical benefit of increasing ADR, there are both economic costs and benefits to the practice to consider when choosing methods to increase ADR. Increasing ADR improves practice revenue by converting the procedure from a standard screening/surveillance colonoscopy to a colonoscopy with polypectomy. It increases pathology revenue and the proportion of patients returning for surveillance examinations. Less tangible benefits include improved reputation and referrals, lower litigation risk for interval cancers and enhanced insurance contracting. These benefits are offset by the costs of the devices and agents, although there is variability in the amount and who bears these costs. For example, a single-use cap is an unreimbursed cost to the practice, whereas a prescribed drug (bowel prep) is a pharmaceutical cost to the patient and/or insurance provider. 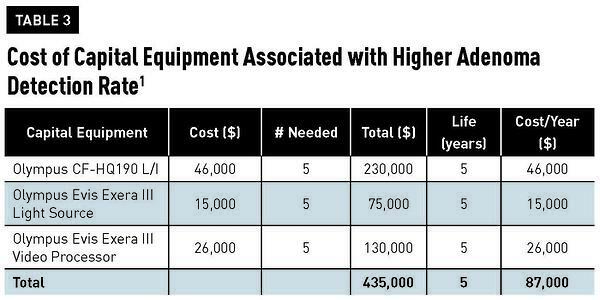 Capital equipment is an amortized cost to the practice. We used simulation modeling based on current Centers for Medicare & Medicaid Services reimbursements to determine the financial impact that an increased ADR would have on both hospital outpatient departments (HOPDs) and ASCs over a 10-year period. In our base case scenario, we assumed a 10 percent increase in ADR based on studies demonstrating similar impacts. We estimated the increase in the number of patients seen over a 10-year period comparing baseline ADR and an increase of 10 percent. These patients were then classified as high-risk (seen every three years) or intermediate-risk (seen every five years), depending on the number and type of polyps found during their procedure. We took into consideration whether the procedure was a standard screening and if polypectomy was performed. We evaluated reimbursement for both HOPD and ASC for high-risk screens, low-risk screens, colonoscopies with polypectomy and the pathology interpretations of the polyps, as well as any physician payments. Costs for each disposable and capital equipment device were estimated from corporate and published websites. We estimated the potential impact that improving reputation would have on the number of colonoscopy referrals and the total reimbursements. These data were based on typical colonoscopy volumes and a conservative 1 and 2 percent increase in volume. Finally, we assessed how higher ADR could potentially lower malpractice costs (Final Table). We used published median gastrointestinal physician malpractice cost of approximately $100,000 per year. 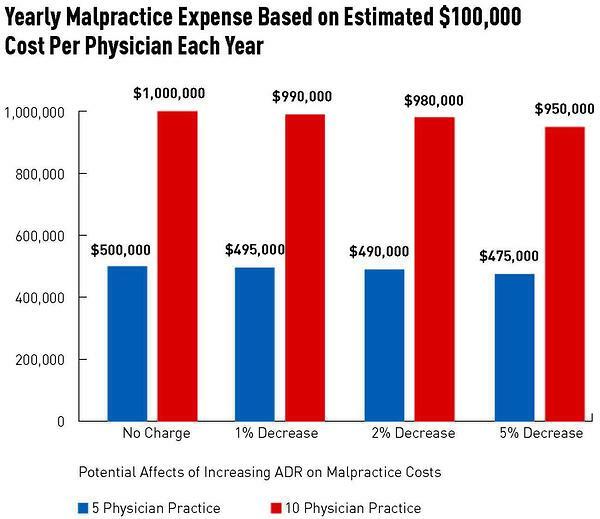 We conservatively assumed that an increased ADR could potentially lower malpractice costs by 1, 2 or 5 percent, and also compared a five-physician practice to a 10-physician practice. 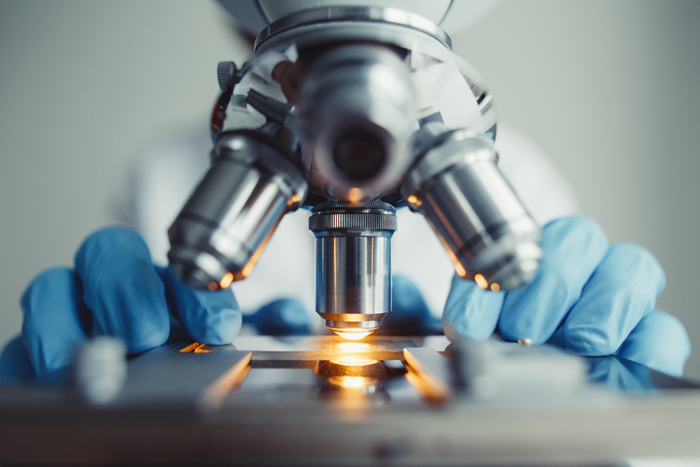 Overall, we found that a 10 percent increase in ADR would yield a 12.68 percent increase in the number of colonoscopies that would return for adenoma surveillance. In financial terms, this corresponds to a 16.95 percent increase in revenue for HOPD procedures and a 17.75 percent increase in revenue for ASC colonoscopies. Per 1,000 colonoscopies, this increase corresponds to a gain in revenue of $193,031 to $260,744 (see “Financial Impact of Increasing ADR by 10% on Volume and Revenue From Colonoscopy”). Although it is more difficult to estimate the value of reputation, a conservative assumption of a 1 to 2 percent increase in colonoscopy referrals due to high-quality reputation data resulted in similar increases in total reimbursements. Reductions in malpractice costs are also difficult to estimate. However, a conservative assumption of 1 to 5 percent would net a $25,000 to $50,000 reduction in expense for five- to 10-person practices. We also assessed the cost of drugs, devices and educational improvements to increase ADR. Currently, there are capital equipment (high-definition) endoscopes, which improve ADR; single-use devices such as specialized caps; and quality improvement education. Each of these items would be considered costs to the practice. Prescribed drugs, such as MB MMX, would increase ADR and represent a cost to the patient/insurer rather than the practice. The primary goal of increasing ADR is to reduce CRC incidence and death, but in this study, we demonstrate the favorable financial impact of interventions to increase ADR. Methods currently used to increase ADR include disposable devices, such as Endocuff (Arc Medical Corp.). These devices cost approximately $25–30 each. Capital equipment such as high-definition colonoscopes can also help increase ADR. One of the benefits to practices of using prescribed drugs to increase ADR is the cost falls on the patient or insurance companies rather than the practice. This study suggests undertaking measures to increase ADR provides mutual and aligned benefits to both the patient and the practice. A limitation of our study is that it is primarily applicable to a fee-for-service model. In the United States and in non-single-payer health systems, increased procedures improve revenue, whereas in closed settings increased procedures actually increase costs. While the clinical benefits of improving ADR should outweigh other incentives, alignment of benefits to patients and financial benefits to practices can provide complementary incentives to improve quality of colonoscopy services. Overall, results suggest that the financial costs of increasing ADR using commonly available tools are offset by equal or greater financial gains, thus removing the financial disincentives to improving quality.